This green-eyed female singer was born in Salinas, California. At an early age, she took a liking to riding horses as she grew up near the Salinas Rodeo. When she was fourteen years old, her family moved to New York, where she attended Erasmus High School in Brooklyn. She always seemed to enjoy singing and her parents encouraged her musical efforts. She started taking piano lessons when she was just eight years old. She later learned the guitar around the age of 18. After high school graduation, Mimi entered Hofstra College, majoring in art. Her guitar instructor heard her sing one day and was impressed to the point of encouraging her to pursue that avenue. In March of 1954, she appeared on the famed Arthur Godfrey Talent Scout show. That led to many offers for other personal appearances. A turning point came in September of 1954 when she was crowned Queen of the Rodeo that was held in Madison Square Garden. Her horsemanship, personality and beauty earned her that crown. She was also pretty sharp with a rifle and won many a competition. When she was just twenty years old, she was recording for Decca Records. Eddie White was her manager then and brought her to the attention of Decca's Paul Cohen. Her first release on Decca was a tune by Hank Williams, "Weary Blues From Waiting" b/w "Oh, I Like It". Her musical talents and career took her eventually to radio station WLW in Cincinnati, Ohio and she became part of the cast of the Midwestern Hayride. After that stint, she tells us she made a number of guest appearances on the Grand Ole Opry, Ozark Jubilee, Louisiana Hayride and a variety of other shows, working out of Nashville with various country and western package shows that starred the likes of such folks as Patsy Cline, Johnny Cash, Ernest Tubb, Minnie Pearl, and others. She also continued to make recordings for Decca. For a while, Mimi was a part of Pee Wee King's band the Golden West Cowboys, traveling by bus from Louisville to Chicago every weekend for his Saturday night TV show. She recalls one particular winter's night standing next to the driver all the way home in a snowstorm to make sure he stayed awake! 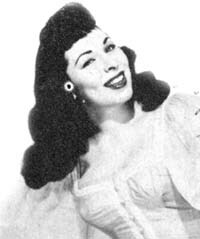 Leo Zabelin, Editor of Country & Western Jamboree magazine back in 1955, wrote in his column that Mimi joined the famed WLW Midwestern Hayride show, replacing Mary Jane Johnson, who had decided to move to the west coast. In 1956, she earned the votes of the fans in Country & Western Jamboree's polls, finishing in the Top Ten for Best Female Singer and Best New Female Singer. Kitty Wells and Wanda Jackson were the top vote getters that year in those categories. In June of 1956, The Disc Jockeys named her the number two Best New Female Singer behind Miss Jackson in the magazines second annual poll. Connie Salzl wrote in her News from the Midwest article in 1956 that Mimi was part of the first Grand Ole Opry show to appear at the Bloomington Stadium in Minneapolis. This event occurred during the Minneapolis Aquatennial. Some of the other stars on that show were Ray Price, Van Howard, Ferlin Husky, Mitchell Torok, the Wilburn Brothers along with local DJ and singer, Johnny "T" Talley. In late 1958, she recorded a duet for Decca with Billy Gray - "Mr. Opportunity" b/w "We're Taking Chances". Back then, Country and Western Jamboree magazine would actually add a few comments of what they thought of the new releases of the day. In this instance, they noted that the timing was good for the duo for there wasn't any other male/female duet activity on the charts at the time. They noted that they both "...did a nice job, both during their own solos and when they harmonize." In early 1956, the same magazine wrote a short synopsis that gave the readers the gist of the two song titles. For her Decca release, "Wrap It Up And Save It" b/w "My Tears Are Beginning To Show", they wrote, "She's not going to give her love away; she's saving it for a new love. There was never anyone but him and now she knows that she made a mistake." One of the highlights of her career was a tour that lasted nearly eighteen months, playing approximately 260 cities across the United States, with the Phillip Morris Country Music Show. It starred Carl Smith, Goldie Hill, Red Sovine, Ronnie Self and, for while, Little Jimmie Dickens. The show entertained audiences in 45 states. She still thinks of it as the trip of a lifetime. A short-lived publication, Rustic Rhythm, included a pictorial that offered a behind the scenes look at what went on with the Phillip Morris Country Music Show. Back then, the traveling was done by bus, and in this case, the sponsor had a bus for the group with the appropriate advertising you might expect as it traveled the roads of the USA. But these were not the most pampered stars that one might see today. The pictures don't show signs of a large entourage of people that cater to the artists. In scene after scene, we see them doing their own primping or cleaning. Goldie Hill was helping Mimi get zippered into her dress for one performance. In another, we see Mimi washing her nylons. In another scene, they ventured out to a local elementary school, even sitting in the teeny desks and perhaps kindling their childhood memories of what they saw in the school books. And in August of 1957, we see a group photo in front of the bus that included Slim Sutberry, Sonny Curtis, Johnny Sibert, Mimi Roman, Carl Smith, Goldie Hill, Red Sovine, Ronnie Self, Bun Wilson, Biff Collie and Sammy Pruett. Now, that's one crowded bus, but you wonder what kind of musical memories that group had. In the spring of 1957, Barry Nesbitt of radio station CKFH out of Toronto, Ontario closed his column praising Mimi's Decca releases, noting they were earning top honors in the "...country gals category..." by Canadian disc jockeys. He noted, "Here's a young miss who can really sing." Smokey Warren noted in that same issue in his round-up of New York news that Mimi "...was doing a swell job with the Phillip Morris package, and why not, she's got what it takes." Barry wondered in his July article, "...if she still ahs that gold dress?" You get the feeling Mimi made an impression with those she met. Rustic Rhythm also had a record review column. In April of 1957, it had this to say about her release on Decca, "Cheater's Luck" b/w "Tonight I Made You Mine": "...does a fine job as she emotionally projects a cheater's good fortune; while the "Tonight" number gerts a happier treatment in the singer's same fine, polished style." But a bit after that tour, she found she had had enough of traveling. She chose to remain in the New York area doing commercials throughout the 1960's and 1970's including Sprite, Doublemint Gum, Clairol Shampoo, etc. She also did demos for writers such as Burt Bachrach, Carol King, Kander and Ebb. She did work as an extra in movies such as "Tootsie" and "All That Jazz". After marrying singer/writer Paul Evans in 1961 and having a daughter, Eden, the couple divorced and Mimi moved to Connecticut. The 1980 found her hosting a radio show in Bridgeport for three hours a day and performed in clubs in the Fairfield County area on the weekends. Mimi stopped performing in 1985 but she still keeps her guitar ready for anything!